A data driven approach to E2E testing. Built on top of selenium-webdriver. Your test files are basically an array of steps, each step being a JSON object that executes an action. Each action defines what to do (like click or navigate) or what to test (like existence of element or value of element). Ability to sniff XMLHttpRequest calls (works over https). Check sniffer.test.js under Samples folder. With this approach, your test files are more readable, easier to maintain and can be written by non developers. After installing cinnamonjs, it will install selenium-webdriver. However selenium-webdriver still needs additional components once installed. Please refer to the selenium-webdriver page for further instructions. steps - The array of steps. skip - A simple boolean to allow turning on/off the test for the whole file. Each array element is called a test step, or simply a step. Each step is a JSON object that defines an action to execute. Each step object should have at least the property action which defines what this step does. Depending on the action itself, it may have other mandatory properties. driver - the selenium web driver instance for advanced operations. step - a reference to the step object itself. log - a function that can be used to log to the console. [Otherwise], the locator can be any valid locator. 'timeout' - (mandatory) (number) maximum time to wait in milliseconds. 'browser.sniffer.collect' - collect data from XmlHttpRequest sniffer that is already attached. The result is an array of Ajax calls (request/response data). 'browser.sniffer.start' - attaches sniffer to XmlHttpRequest ajax calls, must be done AFTER page loads. If you want to repeat the same action as above, but the locator is not known before hand, you can use a function that will be evaluated. 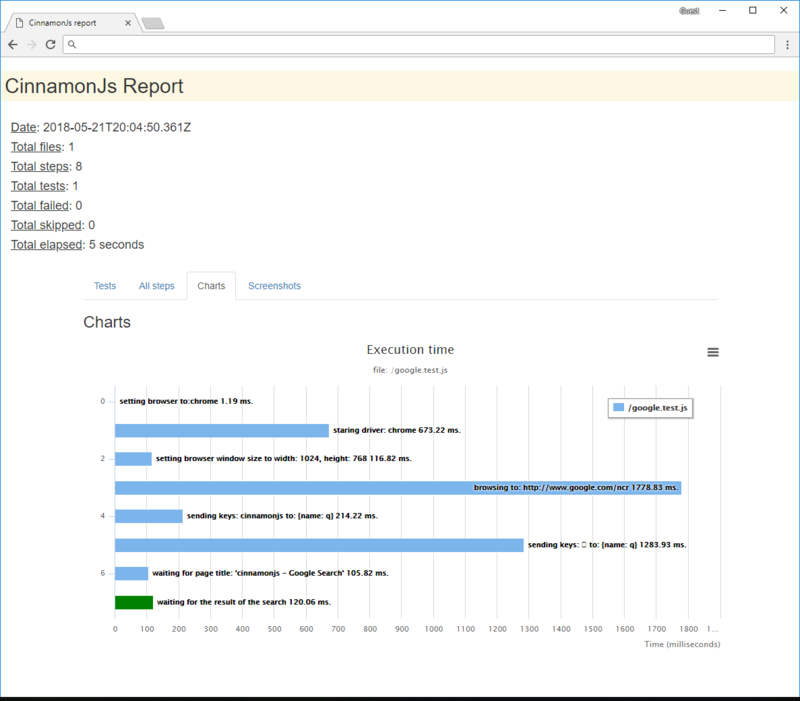 json: is a simple report module that just saves the running log as ‘log.json’ file under the reporting folder. html-offline: is a very comprehensive html based report. This module generates one file called ‘report-offline.html’ that can be opened offline. Date/time of the test run. Total number of steps (including run, failed and skipped). Tests: A tab that shows only the steps that are ‘test’ steps. All steps: A tab that shows the full list of steps. Charts: A tab that shows a bar chart with the list of steps alongside their execution time. 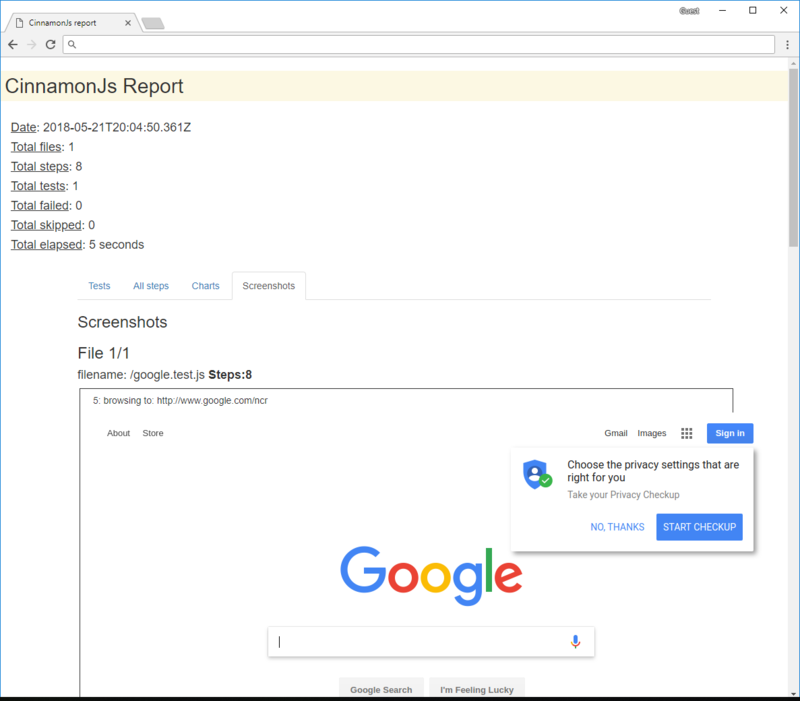 Screenshots: A tab that shows for each step, a screenshot of the browser. What happens if you get to a certain point in your test file and you have a functionality that isn’t covered in one of the defined actions. This is where the custom action comes in. It gives you total control by providing you with the driver instance. The custom action only has one property other than the action itself, it’s fn. startDriver - a function that starts the driver. endDriver - a function that ends (quits) the driver. helper - a helper singleton with many functions, please refer to the file ./lib/actions-helper.js. For asynchronous operation, you can either add the parameter cb at the end of your function defined in fn, or return a promise from your function. The command line arguments you pass serve the purpose of modifying one or more configuration properties found in ./config.js. The format of the arguments is in the form of X=Y, check the next samples. You could also modify options via setOptions function. 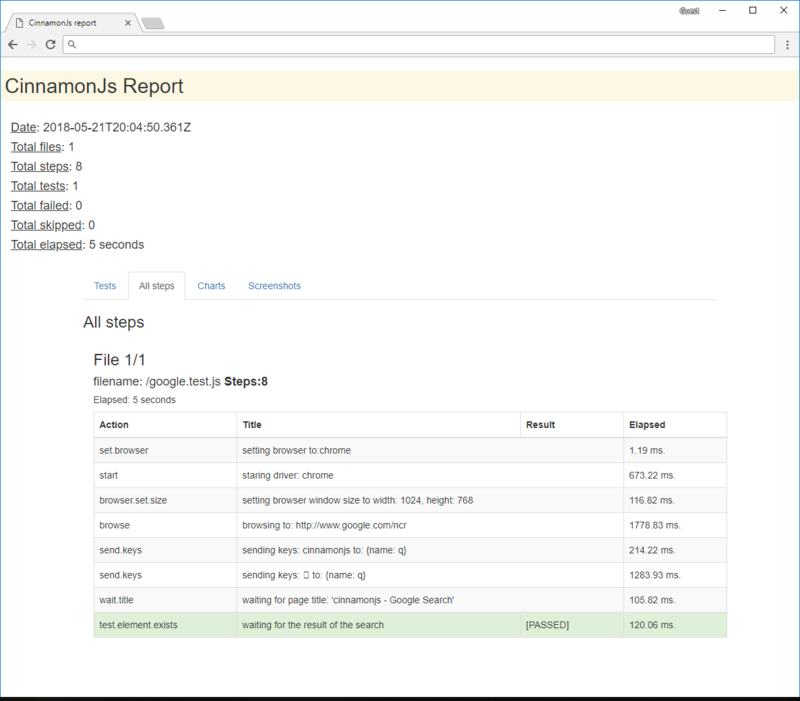 Cinnamonjs needs your contributions, mainly in creating and defining new actions. If you think you have a new action worth adding, fork the project and submit a pull request. Adding actions is very easy and simple, just check the source code of the folder ./lib/actions. cinnamonjs is licensed under the BSD-4 License. 1.0.01: Adding info about reports. 1.0.00: 3 new actions, assert, browser.sniffer.start and browser.sniffer.collect. 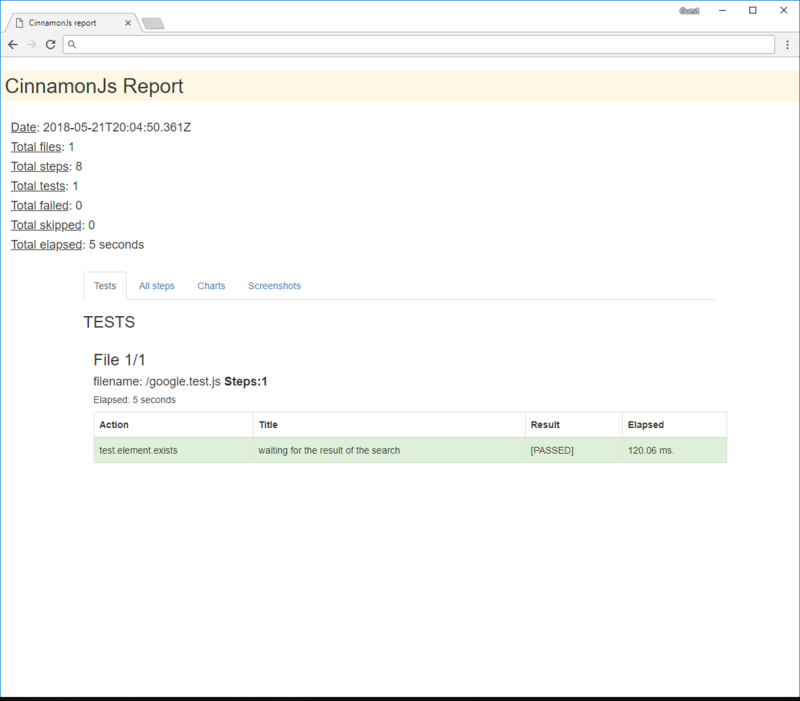 Check sniffer.test.js in samples. 0.9.14: Info action should show in first tab. 0.9.13: Documentation was messed up. 0.9.12: Fixing documentation and action descriptions of timeouts. 0.9.11: Adding 3 scroll actions. 0.9.8: Error handling fixes and adding actions.